Learn how to access supply or works procurement opportunities in the Peel region. 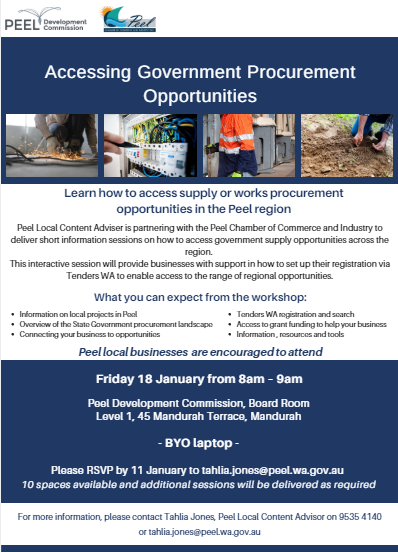 Peel Local Content Adviser is partnering with the Peel Chamber of Commerce and Industry to deliver short information sessions on how to access government supply opportunities across the region. This interactive session will provide businesses with support in how to set up their registration via Tenders WA to enable access to the range of regional opportunities. For more information, please contact Tahlia Jones, Peel Local Content Advisor on 9535 4140 or tahlia.jones@peel.wa.gov.au.